While most people are accustomed to the ceramics that fill their kitchen cupboards, this old-as-time material category has found novel applications in such high-performance fields as the automotive and aerospace industries. Yet, outside of systems for extruding clay, there are relatively few commercially available methods for 3D printing with ceramics and there are even fewer capable of doing so at a low cost. Tethon3D is among the first to do so. After developing its own ceramics material for 3D Systems’ binder jetting 3D printers, the Nebraska-based company went on to launch a crowdfunding campaign for its low-cost Porcelite resin. 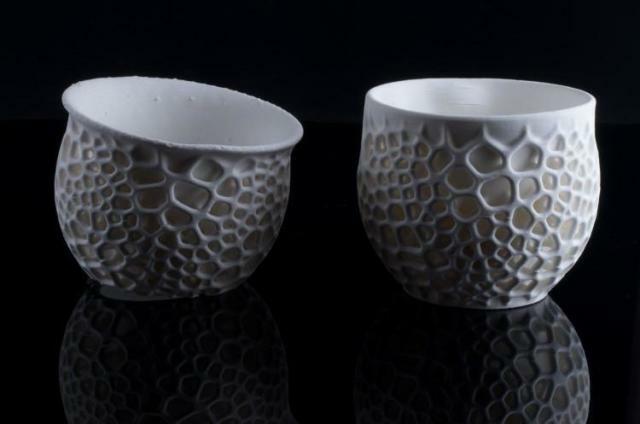 The material makes it possible to 3D print ceramics with vat photopolymerization technologies, such as stereolithography (SLA) and digital light processing (DLP) 3D printers, lowering the barrier to ceramics 3D printing even further. Porcelite is a ceramic-photopolymer composite that sees the photopolymer act as binder between the ceramic particles. Once a print is completed, this “green” part can be fired in a kiln, forming a dense, 100 percent porcelain object that can be glazed and treated like a standard ceramic part. The key advantage to Porcelite is that, at a price of $200.00 per liter, it can be used with low-cost SLA and DLP 3D printers, bringing technology typically reserved for industrial 3D printer manufacturers like 3DCeram and Lithoz down to the desktop level. With its Kickstarter campaign succeeding earlier this year and all backers receiving their orders, Tethon3D is now selling Porcelite online. 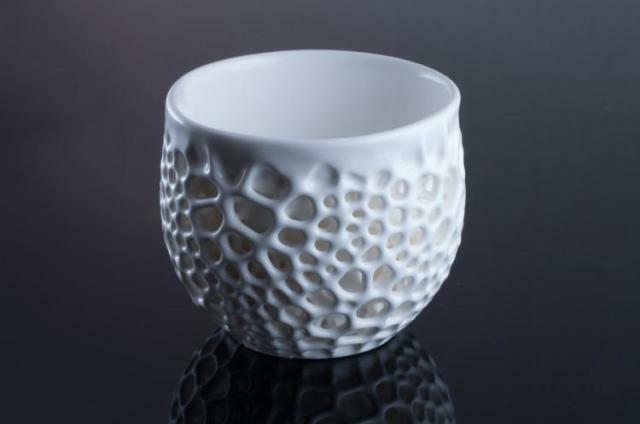 To demonstrate the capabilities of the company’s new ceramic material, 3D printing design studio Nervous System recently published a blog post detailing its experimentations of Porcelite with the Form 2 SLA 3D printer ($3,499) from Formlabs. To test out the design possibilities, Nervous System designed cups that would be impossible to create with any other technology. The models featured dual layers that could insulate the hot liquids within, while making the cups comfortable to hold. The design duo, made up of Jessica Rosenkrantz and Jesse Louis-Rosenberg, explained in their post that the biggest benefit of 3D printing with SLA is the high resolution and smoothness. The drawback, in the case of the Form 2, was its 145 mm × 145 mm × 175 mm build chamber, which, when implementing support structures and making up for the material shrinkage that occurs during firing, is not very substantial. Printing with the material is not all that straightforward either, with Nervous System adjusting the printing process in a number of ways. Some of the interventions that the designers made included intermittently manually pouring the resin into the material vat to prevent separation between the photopolymer and the ceramic powder, mixing the material with each layer, sanding the build plate to ensure print adhesion and using large support structures. The design studio also mentioned that Porcelite prints shrink about 17.5 percent after firing, about 5.5 percent more than typical ceramic shrinkage. The parts also tended to crack more than standard ceramics and would slump during firing. Glazing after the fact, however, was described as quite easy. Despite the issues experienced along the way, once the process was optimized, Nervous System seems to have created a beautiful end product, particularly given the relative cost of the material and the 3D printer. This may be one of the few affordable ceramic-photopolymer composites on the market, but it’s possible that vat polymerization materials will head in a similar direction that 3D printing filaments have traveled, just as the machines themselves have followed similar paths. Low-cost fused filament fabrication (FFF) 3D printers proliferated around 2012 and were proceed by a proliferation of low-cost DLP and SLA 3D printers. FFF filaments are already very diverse, and the materials portfolio is still growing. It would not be surprising to see an increasing number of different types of photopolymer resins also emerge, including different types of ceramics, as well.